You've all probably read this by now, and there are plenty of threads about it on this forum already. However, in the midst of everything, we released a great version for you all. Let us know how you like it. That's a fantastic new feature tucked into this update! Evernote search has become much more powerful for me now since I have numerous Office documents in my account. I am also not seeing the new Quick Note functionality. I have the Mac App Store version as well, but the release notes for that mentioned this feature also, if I recall correctly. Same here. No Quick Note. CMD+CTRL+N gives me a full new Evernote Note Window. Updated to 5.06 via Mac App Store, but do not have the functionality of the new Quick Note. Restarted my Mac, etc. but continue to have old version in menu bar. I've checked preferences, etc. to see if there is a setting I've missed, but not luck. Anyone have a solution? - Text can be entered, but it doesn't appear on the screen as it should. Please see the video. I'm finding that screen capture is broken. I use the "Clip Rectangle or Window" feature (Keyboard Shortcuts) system-wide all the time, but it's no longer working in the latest update this weekend. Also, pasting images outside EN remains broken. I used to paste images captured using EN into Mail messages & elsewhere. This has been broken for several updates and remains broken now. I can paste OK within EN, but outside EN only the top portion of an image will paste. The bottom half (or more) isn't there. Fingers are crossed for fixes to both issues as I need these features. - Dragging multiple notes into another one ought to create multiple green note links, but instead it only creates one blue unique identifier. See the video. Is this a "feature" or a "bug"? What OS are you running where you don't see Quick Note? I would make sure you've run your Mac's software updates and try again. Quick Note was designed to work on the latest versions of 10.6, 10.7, and 10.8. Specifically, is this note link thing a new feature or a bug? 10.8.2. I am as up to date as you can get. New quick note feature not working for me either. All software up to date. Running 10.8.2. Everything is up-to-date, but the new Quick Note is simply not there. Same here - On 10.8.2 but no Quick Note. Just a regular new note opens up. I'm also running 10.8.2 and Evernote 5.0.6 but no Quick Note. Quick Note works for me on the latest Evernote version downloaded from your website. It does not work on the Mac App Store version. All software and OS X are checked with the latest update. I don't see the new "Quick Note" window too. There is a "quick note" option in a new menu shown when you click in the gear wheel icon. This icon is shown in the new window upper left corner when you click in the elephant icon. The lost option now is "paste in Evernote", very useful for me. While it didn't get any love in change list, THANK YOU for allowing Spotlight search to pop up only the requested document, and not the main window. I live and die by Spotlight and I can't tell you how much grief that was causing me. Very happy! Unlike others, I am on latest 10.8 and I do get the new quick note feature. A new issue though: if you choose NOT to display the Elephant in the menu bar (one of the preferences), then the keyboard shortcut does nothing. It would be nice if it would fall back to the old behavior and pop up the full note window, but at the least it should disable the keyboard shortcut if the icon isn't shown, very confusing otherwise. Or don't allow people to turn off the menu item at all. I reported earlier that my update of Evernote did not provide the Quick Note functionality. I have two Mac's... a Mac Pro and a MacBook Air... and while the Mac Pro update did not provide the Quick Note functionality, the MacBook Air update did. Both are running the latest versions of all software. I think the difference was, that when I updated the Mac Pro using the Mac App Store, Evernote was running at the time. Of course, the update process quit Evernote, but for some reason, I don't think it quit properly. The Evernote icon was still in the menu bar. So I suspect the app didn't get properly updated... or at least the helper in the menu bar didn't. This is different from the MacBook Air update where Evernote was not running at all when I initiated the update from the Mac App Store. This update went flawlessly. To remedy the situation on my Mac Pro, I tried deleting the Evernote app from the Applications folder and re-installing from the App Store, but that didn't help. I guess whatever component is responsible for the menu bar helper did not get update doing that. Bottom line... someone needs to provide some instructions on how to properly update the menu bar helper portion in the case of a failed update from the Mac App store. I'm not entirely sure what I did, but I fooled around with the preferences & the elephant icon as starkos was writing, and I got screen capture ("Clip Rectangle or Window" in Keyboard Shortcuts) to work again. The pasting issue outside Evernote, which I mentioned above, still persists however. And BTW, after doing this Quick Note functionality is working. 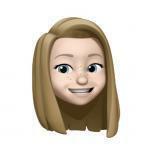 I'm running 10.7.5. I think this is probably the problem. This is how I installed it. I noticed after reading this that I could 'Quit' the icon in the menu bar. The icon disappeared, but Evernote was still running. I closed Evernote, and now both quit when I quit from the menu bar. But the Quick Note option, while I can set it in Preferences, doesn't work, and follows the menu bar option which is still 'New Note', even if I set quick note through the preferences to a different short cut key. Same here. 10.8.2 Evernote 5.0.6 no Quick Note. Using the keyboard strokes launches EN and opens a full size note window. After updating the latest version of evernote that required that i change my password, i have lost a week's worth of data and the application on my laptop is now corrupt. Open Activity Monitor on my Mac and quit all Evernote processes. Open Evernote and voilá - I had the Quick Note functionality. You can't exactly follow those steps if you've already updated, since there's no way to reapply the update. 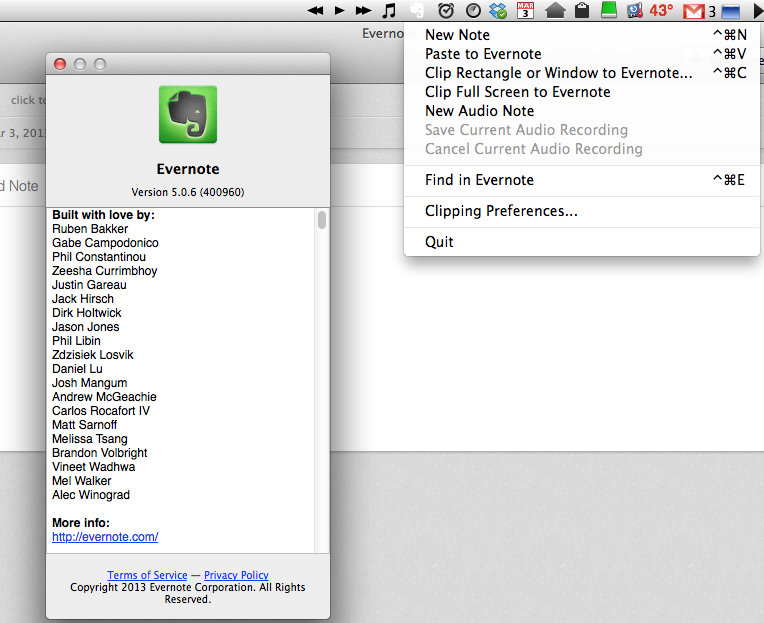 I guess I could try deleting Evernote from my Mac, then reinstalling it. YMMV, but I'd already installed it, too (though it WAS the beta 2 version), but I just re-ran the .dmg and it fixed it. With the App Store version, you might have to reinstall, but as that wasn't my experience I can't really say if it'll work... I just know that this fixed it for me - I had to quit the helper for it to update, as well. Still NO Quick Note functionally. Ok. These steps solved my problem. I use the Mac app store version. 8 - Voilá the new quick note is now working. I just tried this and it worked for me. Thank you bpabreu. Ok, logging out, quitting and restarting did it as bpabreu suggested. I didn't need to delete any files from my library though. Just logout and quit. I had already reinstalled once though as noted above. It sounds like restarting your computer should do the trick. Can anyone else confirm this fixes quick note? It's not restarting your computer. I did that a dozen times. It's logging out / signing out of the Evernote desktop app, quitting evernote (& helper). Then restarting Evernote. That's what worked for me anyhow. 1. Sign out of Evernote from the "Evernote" menu. 3. Quit the helper from the menu bar menu. 4. Verified no Evernote processes were running in Activity Monitor. 5. Deleted the Evernote application, but none of the support files. 6. Reinstalled from the App Store. 9. The new Quick Note worked when I clicked the menu bar icon. Reading what other people have done makes me think deleting and reinstalling weren't even necessary, but at the time I figured I might as well. I got it simply by signing out. As I signed out, I got a message that my notes were being migrated to the new version. Then I just signed back in again. Same thing here. I can click on the menu bar elephant and get the window, but nothing in it is clickable...it's just "there". Not even the gear icon can be clicked. OK, It's still not working. I have the Quick Note appearing, but I can type in it, drag and drop into it, screen capture into it, but the content never gets into my Evernote notes! This is so frustrating. OK, Got it. Sorry for the multiple posts. I had to sign out and sign back in to the desktop app too. Now I think most things are working (apart from a few iPhone/iPad apps, but I guess they just have to be reauthorised). OK, Got it. Sorry for the multiple posts. I had to sign out and sign back in to the desktop app too. This worked only once for me. After the re-login the missing quicknotes were loaded but not any additional ones from that point on. Quick Note is really unstable overall for me. If the desktop app isn't running and I add a Quick Note -- then open the desktop app, the note does not show up until I add another Quick Note, then they both show up at the same time. Adding a Note when only the Helper is running seems to put the note into some sort of limbo mode and I can't access it on any device. For many anyhow, it doesn't seem ready for prime time. URL auto-recognition still has bugs on Firefox. &n will cause the recognition to fail. Why not simply treat all strings with prefix http:// as links? This bug has lasted for too long. I am running OSX 10.8.2 and ctl+CMD+C is not working anymore with Evernote 5.0.6..... it wa still ok with the beta's.... send a fix pls !!! Each time I open the Evernote app, the menubar Helper disappears for a second and then reappears (looks like it quits and relaunches). This means that if you type something in Quick Note (without saving it), then launch the Evernote app, you loose anything you entered into QuickNote. @Tom, it doesn't look like any content is getting lost. Let me know if you experience otherwise.